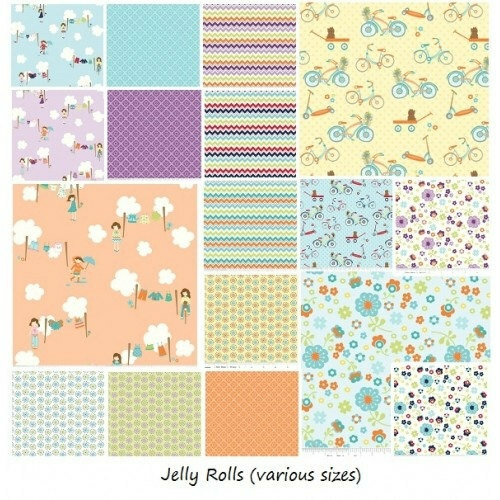 Glam Fabrics sells fabric bundles (I love bundles ;) jelly roll packs, and even single yard or fat quarter sets. 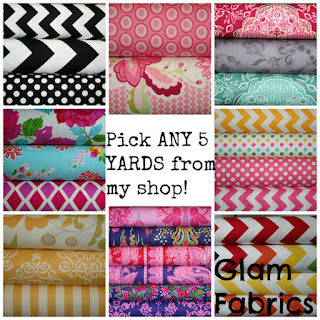 And she even offers mix and match yard bundles for a CRAZY amount!!! Plus, she is giving all PR&P readers a discount that will be good through this weekend! 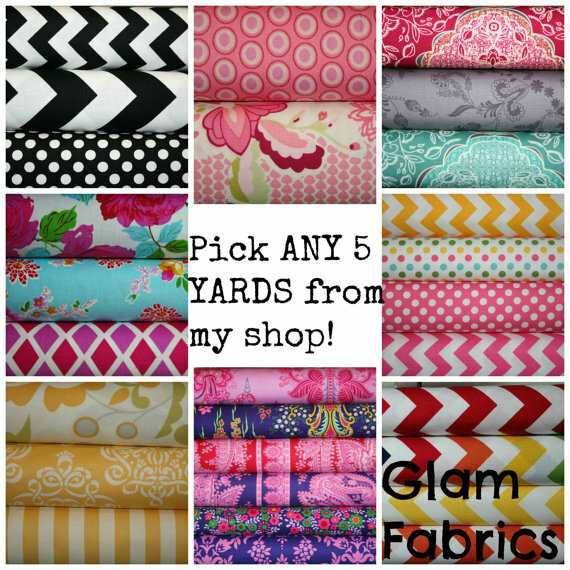 a $30 store credit to choose any fabrics you would like! Small Red Dots Riley Blake - or any other polka dot fabric she has! I had never seen the Madhuri line before. I LOVE it! My favorite is the Madhuri CIRCLES in Blue . Thanks! I really like the Madhuri line she is offering! I also like the new Bijoux line. I am loving the Madhuri main fabric and also the Femme Metal fabric by Rock n Romance. Loving the Lacis Blueberry Fabric in turquoise and grey scroll! Would be awesome in my laundry makeover... Curtainsor even a iron board cover, perfect colors!! I'd get the rainbow knit fabric! I love Madhuri fabric CIRCLES. I'm digging the chevron minky fabric in silver. The Jennifer Paganelli fabric looks lovely!!! Oh my, I loved the half yard bundle of lime green chevrons and dots. How much fun might those fabrics get into? I like the Jennifer Paganelli Circa bundle. Really, everything in her shop looks great! 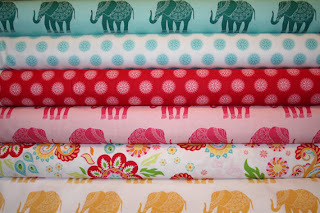 The elephants on the blue fabric are just gorgeous!!! I love them! I think it might be Amy Butler's QUEEN ANNS BUTTERFLIES in Topaz. That or the rainbow jersey knit. I love the different dot and chevron bundles! I actually love the giveaway fabrics. I could easily see myself making something to send to the Jane India Mission who is caring for several orphans. I'm sure the girls there would love a dress or skirt out of that material. Thanks for the giveaway. Love project run and play. Love the minky bundles and chevrons! LOVE the Jennifer Paganelli Happyland in Sky! My love for Joel Dewberry knows no bounds so I definitely would be picking up some Aviary 2 action! SO hard to choose (with all of those options! ), but I have to go with Aviary 2 in plum...I've had my eye on that fabric for a while! I LOVE all of their fabric, especially Happy Land fabric Claudia in blue! Oh my goodness! I can't believe the price of those custom bundles! I'm definitely going to have to order next time I have the spare funds. Boy Howdy! I've always been a fan of Joel Dewberry's Aviary. I have some of the orange colorway in my stash, but that purple is calling my name. Black Mustaches? Um yes please! Circa, Art Gallery or Crazy Love!! Crazy Love I think is my fave! But, wow! These are so pretty! SO many I would love to create a masterpiece with! OOOOhhhh. Thank you! These are awesome fabrics! I wish I had known about this store when I made my last quilt for my friend's baby shower. I think the blue elephants are my favorite actually. I love that they aren't just cartoony elephants! Love the Joel Dewberry Aviary 2 - Sparrows in Plum. I love the chevron knit in hot pink. 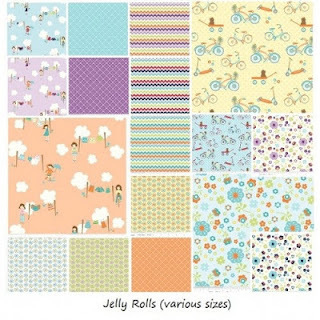 Too many good choices, but I think the Dress Up Days fabrics would make a great kids quilt. Madhuri yellow elephants , I love it.. It is WAY to pick a favorite....but I love the Khumari Garden Fabric! Never heard of Madhuri before today. Just LOVE the elephants!! I know a gal who collects elephants. What fun we could have with this!! I love any cheveron or polka dots fabric. She has some beautiful fabric in her store. Thank you for sharing. I love Glam Fabrics! Really need those Madhuri elephants! Poetica sweet melody in aqua is such a pretty fabric....I made a quilt for one of my grandbabies in that colorway and it is one of my favorites. Dot stripe pink is pretty. I like the Madhuri line of fabric. Thanks for the giveaway! I like the Madhuri bundle, but I also really like the Chevron & Dots bundle and Jennifer Paganelli's CIRCA! I love the greenish Madhuri Elephants!!! I love the Chevron Prints, I would totally get the 4 yard bundles. It would fun to make a crazy quilt with the chevron prints! Love the Riley Blake rainbow mustache fabric with coordinating red dots. Would make such a cute dress! Thank you for the giveaway!! Sparrows in bark is one of my favorites. I like Raining Rainbows. Thanks! I love love love this one: IKAT Fabric DAMASK In Aqua - Tangier - by Dena Fishbein. Thanks for the giveaway! I adore the Joel Dewberry Aviary 2 sparrow fabric. TAZA yellow damask because I've been looking for some yellow damask. Joel Dewberry Fabric AVIARY 2 for Free Spirit - Sparrows in Plum - is beautiful! Every single one of the chevrons! Love! I like the Taza collection. The Raining Rainbows in grey. I love the Mystique fabric in Grey Damask by Lila Tueller Designs for Riley Blake. The Kumari Garden fabric is beautiful. I love the scrap bags. I also love the LOVE and JOY bundles. Teal Elephants... what is NOT to like about that?! So many to choose from. Still, I'd have to say my favorite is the madhuri elephants in any color. I've been a little obsessed with elephants ever since I had my first son 5 years ago. I am now drooling over the teal elephants and if anyone has 60 to lend me so I can buy this bundle I will cry tears of joy! 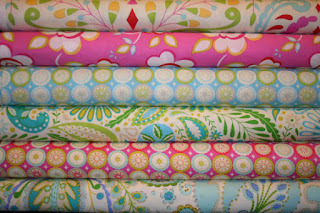 luv luv luv this fabric....neeeeed neeeed neeeed to make some more pretties! I love the medium rainbow chevron fabrics by Riley Blake! I like the Mahurdi Elephants.Thanks. The Amy Butler Imperial in Emerald is beautiful! Thanks for sharing. My daughter LOVES elephants so the Madhuri elephants are perfect! I love all the bright colors and my favorite fabric is BIJOUX in Divine Gypsy Rosewood. This is such a great prize and would lead to many hours of joyous sewing. I love the 7 yard bundle of Kumari Garden. So much I could do with it. I love Rock n Romance by Pat Bravo. Thanks for the great giveaway chance! Pinwheel fabric in Multi From the Bikes and Trikes - It just looks so happy! I love the Joel Dewberry Aviary 2 Lodge Lattice in Lilac fabric! The Amy Butler Queen Ann's Butterflies is very pretty. Cant Tame These Frames says, " I love any fabric that Jennie sells These are the ones sitting in my cart until I have more money, Kumari Garden Sashi in pink, Imperial Paisley in Emerald, Small chevron and small dots in baby pink, Mustache in black by RB, and Carnaby Street in Royal. Jennie was my first friend on FB last night. I can't believe I am trying to win something and I have only been on FB less than 24 hours. Jennie was my first friend on etsy and not only that, she was my very first and only customer on etsy. YOU ARE THE BOMB, Jennie. I love all of your fabrics and really enjoy using them for my "frames"!!! I love the mustache fabric in black!! Fun! Love the dress up days line but must have the pink elephants! Love love love the black mustache fabric! I actually love the Madhuri!! the Poetica Collection by Patricia Bravo would totally make my day! I totally need that to make a bag out of! What a lovely shop! Thanks for introducing it, and for the awesome giveaway. I love Amy Butler's Sketchbook Roses. Her shop has the cutest fabrics ever! I really love the Circa line by Jennifer Paganelli! I can totally imagine the cutest quilts made from that collection and maybe a couple itty bitty sundresses for dd. It's tough to choose a favorite because she has so many great lines in stock! I have ordered from Jennie before and will order from her again! 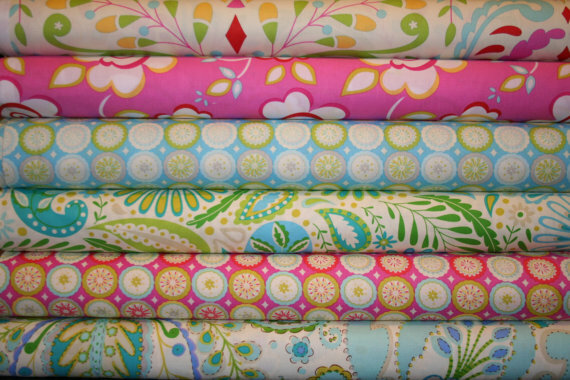 Her fabrics are clean, she ships quickly, and there are always new fabrics to browse! Love the Circa and Madhuri! Awesome giveaway! Tough to decide on one favorite-but I narrowed it down to Art Gallery Rock n Romance! I love the Joel Dewberry Fabric AVIARY 2 for Free Spirit! I love Glam fabrics!! Such beautiful selections! I love the Riley blake pinwheels! It is VERY hard to pick just one but the Jennifer Paganelli CRAZY LoVE is what I have at the top of my list! Madhuri! I LOVE those elephants! Tough choice between madhuri and dress up....can I have both please, pretty please with a bow on it. I really like the pinwheel fabric in the Bikes and Trikes line. I'm always buying chevrons but I really love those Madhuri elephants! Anything Riley Blake or Amy Butler! Jennie is FABULOUS!!!! Oh I love the anthology pinwheels as well as anthology's animals. So lovely! My favorite of her fabrics are all the chevrons and the mustache!! Oh my, there are so many lovely fabrics! I really like the Madhuri Yellow Elephants. Love Chevron and Dot Fabric Bundle Small and Medium BABY PINK Chevron - Baby Pink Small Dots By Riley Blake Designs. Thanks for the giveaway! The LOVE and JOY bundles are so cute! I love the rainbow knit. It could make a great skirt!